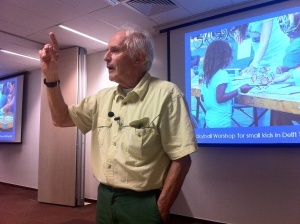 “That moment when children realize they’ve created something, that moment…”, Nobel laureate Harry Kroto paused mid-sentence, “there really is nothing like it”. There was a brief silence, then the audience realized this was the final statement from Skoltech’s guest lecturer. Then came the applause, the smiles and a procession of audience members. They waited for their turn to chat with the chemist who received a Nobel for the discovery of Buckminsterfullerene, a carbon-made sphere which resembles a soccer ball. Kroto fondly refers to it as Buckyball. But it’s a different kind of simple natural beauty that energizes and enchants the 74 year old man: young people’s ability to be curious and creative. 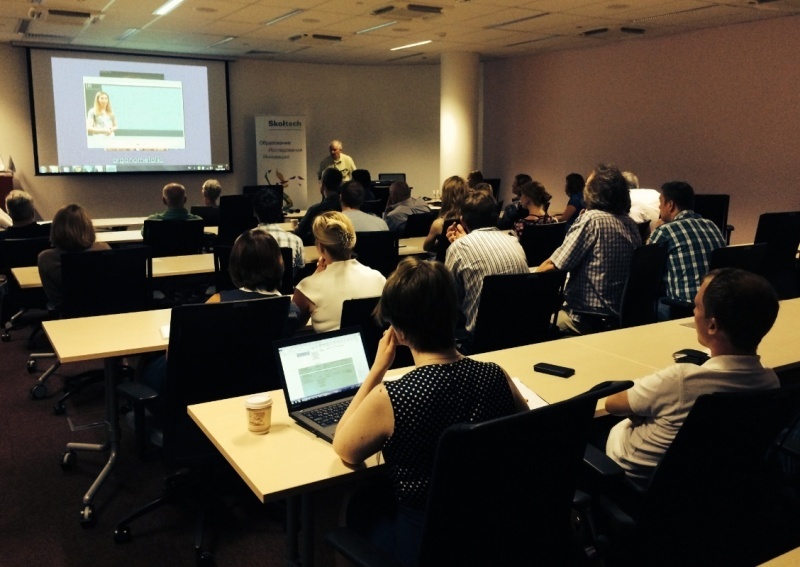 He now devotes his life to what he calls “the triple educational revolution of the Goo-You-Wiki World”, the title of his guest seminar at Skoltech. 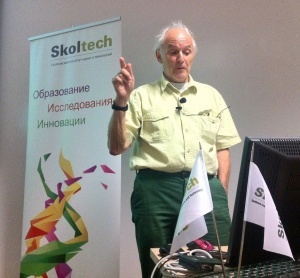 Kroto sees a world where Google, YouTube and Wikipedia open up a new range of possibilities for teachers and students. To illustrate his point about the effectiveness of online education tools such as GEOSET, the Florida State University professor recruited a dream line up. Copernicus, Galileo, Picasso, Darwin and Snoopy were all feted in front of a full house at the Skoltech auditorium. There were also objects. One of them was a camera rescued from Berlin just before the Second World War. “It used to be hard work to take a picture, you had to understand the mechanism and the chemistry”, said Kroto, “nowadays kids don’t know what’s going in and on a smart phone camera – but they also don’t care. We need to bring back the curiosity. “The ethical purpose of education involves teaching young people how they can decide for themselves what is true or false. Does preying work as well as your mobile phone?” He smiled, then became serious again. “Penicillin was a miracle but now antibiotics-resistant bacteria pose a grave threat. But how do we convey this intriguing complexity? A member of the audience wanted to know how come Kroto uses humor so often, but fails to mention it directly in his presentation. It is not every day that you meet a Nobel laureate in chemistry who calls himself Harry, rather than Professor Kroto or Sir Harold. But this guest speaker, slated to give a Skoltech seminar on July 15, is different. Perhaps it’s because he focuses not on his own credentials but on future generations. Harry Kroto deals with new ways of tapping into young people’s creativity, in an ever-changing landscape of webinars, online courses, and seemingly endless knowledge. 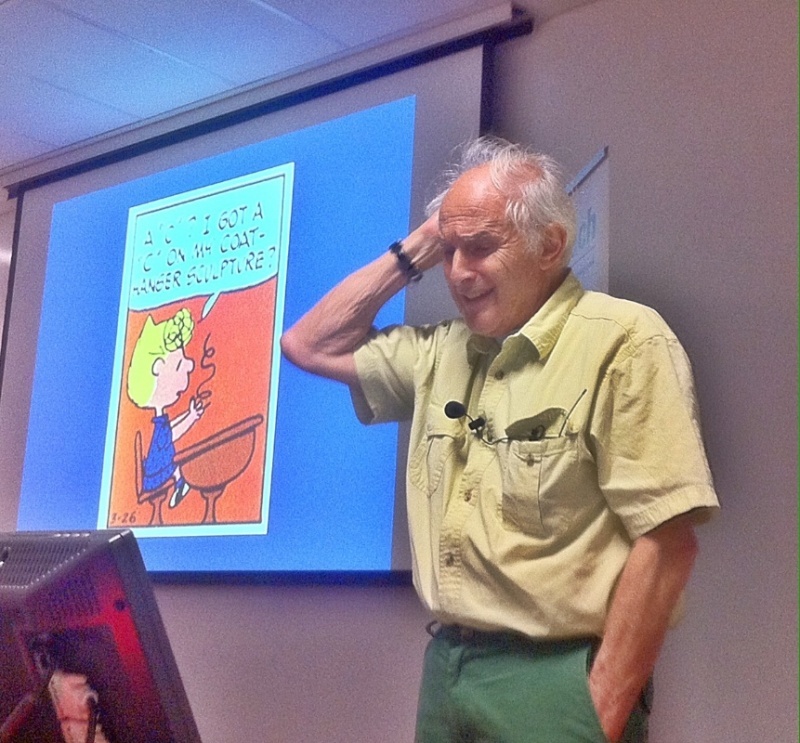 Harry Kroto cares about young people living in what he calls the GooYouWiki World – and their brains. The aim of education is to uncap the creative potential of every child and we now have a new device which promises to help us do better than before. The Internet has initiated the second great revolution in education; the first was initiated by the printing press. The GooYouWiki World not only makes information almost instantaneously locatable and accessible today, but it also enables anyone with expertise and the passion to communicate to contribute to the amazing globally-accessible cache of knowledge. On-line education is of course invaluable for students who are unable to attend a university physically but it is not clear that the simple repackaging of courses utilizes the new technology to its full potential. For instance the traditional teacher-student dynamics is basically no different on-line from what it was before and certainly the close personal teacher-student interaction, often so crucial in successful education relationships, is lost. We should thus also explore the new imaginative educational approaches which this technology offers for instance to conflate synergistically with, rather than replace, traditional ones. A first initiative in the UK, www.vega.org.uk, is now a fantastic archive of recordings by outstanding scientists and its spin-off is the Global Educational Outreach for Science, Engineering and Technology (GEOSET) initiative (www.geoset.info) which is aimed at capturing the ingenuity of teachers to explain specific topics which can be used by other teachers elsewhere on the planet. It also enables students to contribute creatively to the great humanitarian endeavor of building the “Global Cache of Knowledge” and at the same time improve greatly their career prospects. GEOSET turns the dynamics of the teaching process round by 180 degrees and focuses on the educator capturing what the teacher wants to teach. Our new related initiative is assembling Teacher’s Tricks of The Trade, focused nuggets of teaching genius to be streamed from the new www.TToTTs.com website for other teachers to employ in their own lessons and lectures. 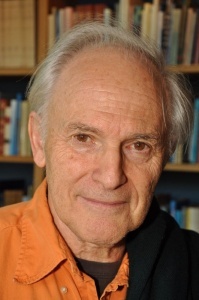 Professor Sir Harold Kroto FRS, was knighted in 1996 for contributions to chemistry and later that year, together with Robert Curl and Richard Smalley (of Rice University, Houston, Texas), received the Nobel Prize for Chemistry for the discovery of C60 Buckminsterfullerene – a new form of carbon. Fellow of the Royal Society (1990), Foreign Associate of the National Academy of Sciences (US), President of the Royal Society of Chemistry (2002-2004). Longstaff Medal of the Royal Society of Chemistry (1993), Faraday Lecturer 2001 (Royal Society), Copley Medal of the Royal Society (2002), Erasmus Medal of Academia Europaea, Freeman of the City of Torino, 29 Hon Degrees.